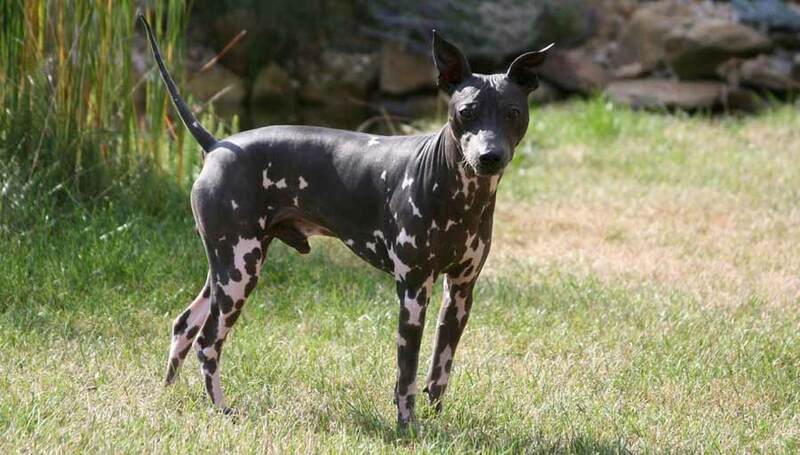 American Hairless Terrier was born in the early 1970s, as a hairless puppy in a litter of Rat Terrier puppies. That puppy was the origin of the American Hairless Terrier (AHT) breed. In fact, for many years, the breed was known as Rat Terrier—Hairless Variety. In January, 2004, the breed was renamed. The American Hairless Terrier breed has two sizes: toy and miniature. The Toy American Hairless Terriers are 7.5 to 11 inches tall and weigh between 4 and 8 pounds. The miniature American Hairless Terriers are 11.5 to 16 inches tall and weigh between 8.5 to 16 pounds. In both sizes, the American Hairless Terrier dogs strongly retain their Rat Terrier heritage and appearance. They are well-balanced and muscular. Although American Hairless Terrier puppies are born with short, fuzzy hair, by 8 weeks old, they have lost it. Their skin is soft, smooth, and warm. They have freckles or spots of black, brown, or red. Grooming the American Hairless Terrier is very easy. The skin can be washed with a damp rag. They can sunburn so they must be protected from too much sun exposure. This is a high-energy breed. They can go for a long walk morning and night and will enjoy several games of catch and fetch. As befitting their terrier heritage, they also enjoy hunting for small critters in the backyard. American Hairless Terriers excel at agility training. This breed needs early socialization, as these dogs can be wary of strangers. Early training is a plus, as AHTs have a quick, bright mind and if you don’t set some rules, they will. After basic obedience, have some fun. American Hairless Terriers love trick training and are devoted and loyal to their family. They are active and can be great with older children who respect them and are not too rough. They can be good with other dogs, although play with larger dogs should be supervised. They are not always good with smaller pets. Health concerns include knee problems, hip and elbow dysplasia, and allergies. The small gene pool in the breed is concern to some. Share your American Hairless Terrier story. Note: Upload only American Hairless Terrier picture or your picture with American Hairless Terrier below - spammer's ip may be blocked.